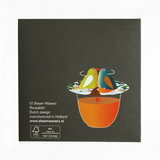 Love Birds; A giftbox with 10 reusable Steam Waverz, one bird dessins in several colour variations. With this bird waverz the sun is shining in your house! 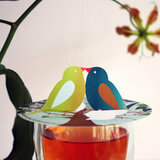 Create a teagarden feeling with this beautiful bird motive. The Giftbox Love Birds is a beautiful box with 1 finely illustrated bird designs. 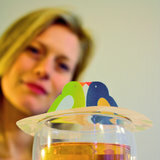 Elevate your mood with these steam waverz above a nice cup of tea or coffee. The stories will litterary unfold before your eyes! Who do you give this gift?